Weltek* expands its offer in Kapio* welding helmets with graphics, successfully answering welders and distributors wishes. 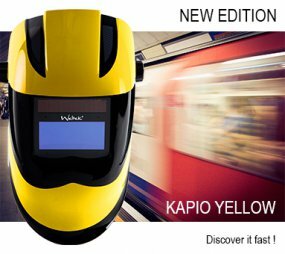 Available in S4 version and with side vision (item number PL21S4), the Kapio* Yellow Gangster helmet completes our wide range of Kapio* welding helmet. Do not hesitate to download the flyer !